A little movie called “Star Wars: The Force Awakens” premiered in Hollywood last night, and while the review embargo won’t lift until midnight Pacific tonight, the lucky few who attended were free to share general reactions on social media. And share they did, mostly exulting that J.J. Abrams and crew have crafted the best “Star Wars” movie since “Return of the Jedi,” or even “The Empire Strikes Back.” Putting “The Force Awakens” ahead of the little-loved prequels isn’t an especially robust compliment, but it’s bound to ease at least some of the anxiety fans old enough to remember being burned by “The Phantom Menace” are going into the new movies with. Although the reviews won’t be, these reactions are entirely spoiler-free — there’s not a blessed word about what the deal with Luke is — so if you’re itching to have your enthusiasm stoked without learning a blessed thing about the movie, you’ve got 18 or so hours to soak these in. 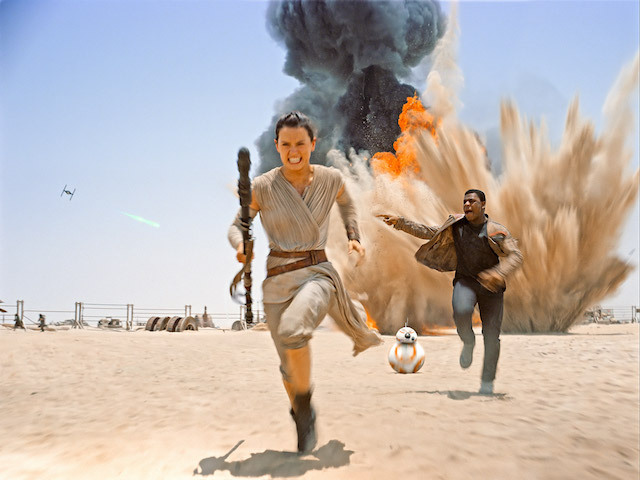 Among its many wonderful qualities, STAR WARS: THE FORCE AWAKENS passes the Bechdel test. I’ll say this to non-spoiler about #StarWars #TheForceAwakens. You’ll laugh more than you expect. And you’ll be hit harder than you expect. I have some more complicated thoughts on TFA, but will save them for the review. Some faults, but no doubt best Star Wars film since ’83. STAR WARS: THE FORCE AWAKENS… Sometimes fun, often fine. It had a lot to set up, and I suspect Ep 8 will be able to do more with less. “Star Wars” is back. And it’s never going away again.